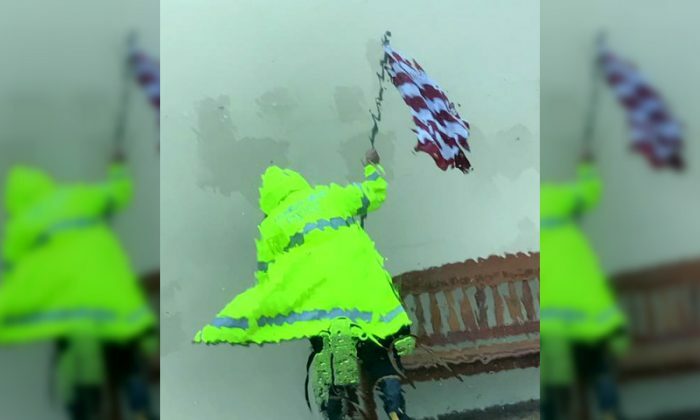 A police officer from Arkansas, Texas, saved the American flag from the fury of Hurricane Harvey on Friday, Aug. 25. The photograph quickly went viral with dozens of people praising the brave officer’s actions. 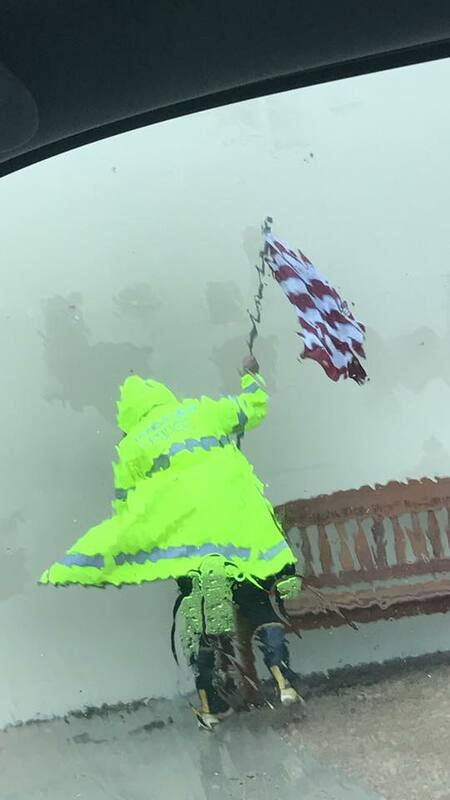 Officer Jack McCarty ran into the storm to rescue the flag from the hurricane that was hours from landfall. McCarty can be seen holding the flag just before he brought it down to safety. “While some dishonor and desecrate her, APPD Ofc. Jack McCarty will stop at nothing to honor and save her,” the Aransas Pass Police Department wrote on its Facebook page, adding the hashtags for God Bless America and Hurricane Harvey. More than 4,000 people liked the photo and more than 3,300 shared it in the 16 hours since it was posted. “If this officer did this on his own initiative, he should receive some type of recognition. It is great to see such a patriotic act. Semper Fi, Jack,” wrote Facebook user Aaron Miller in a comment to the post. “God bless this officer, this American,” wrote Facebook user Naomi Hill. “Our men in blue for the love of our land will do what needs to be done.God Bless Texas!” wrote Facebook user Janet Thompson. The most powerful hurricane to hit the U.S. state of Texas in more than 50 years moved slowly inland on Saturday, dumping torrential rain expected to cause catastrophic flooding after battering the coast with 130 miles per hour winds. Texas utility companies said just under a quarter of a million customers were without power. Wind and rain continued to lash the coast as residents began to assess the damage. Harvey is the strongest storm to hit Texas, the center of the U.S. oil and gas industry, since 1961. The seaside town of Rockport, 30 miles north of the city of Corpus Christi, was hit hard. Several homes had collapsed, and many more buildings suffered damage. Roofs had been ripped off some, and windows blown in. The streets were flooded and strewn with power lines and debris. At a recreational vehicle sales lot, a dozen vehicles were flipped over and one had been blown into the middle of the street. Valdez said he stayed through the storm to look after his animals. “I have these miniature donkeys and I don’t know where they are,” he said, as he sat in a Jeep with windows smashed by the storm. Resident Frank Cook, 56, also stayed through the storm. “If you have something left of your house, you’re lucky,” he said, surveying the damage from his vehicle. Before the storm hit, Rockport’s mayor told anyone staying behind to write their names on their arms for identification purposes in case of death or injury. A high school, a hotel, a senior housing complex, and other buildings suffered structural damage, according to emergency officials and local media. Some were being used as shelters. The coastal city of Port Lavaca, farther north on the coast, had no power and some streets were flooded. “There is so much tree damage and debris that the cost of cleanup will be enormous,” Mayor Jack Whitlow told Reuters, after touring the city earlier Saturday. The hurricane came ashore near Port Lavaca late on Friday with maximum winds of 130 mph. That made it a Category 4 storm on the Saffir-Simpson scale, the second-highest category and the most powerful storm in over a decade to hit the mainland United States. The streets of Corpus Christi, which has around 320,000 residents, were deserted early on Saturday, with billboards twisted and strong winds still blowing. City authorities asked residents to reduce use of toilets and faucets because power outages left waste water plants unable to treat sewage. The city also asked residents to boil water before consumption. A drill ship broke free of its mooring overnight and rammed into some tugs in the port of Corpus Christi, port executive Sean Strawbridge said. The crews on the tugs were safe, he added. The city was under voluntary evacuation ahead of the storm. The storm weakened to Category 1 early on Saturday and was expected to be downgraded to a tropical storm later in the day, the U.S. National Hurricane Center said. Harvey was about 150 miles west-southwest of Houston, moving at about 2 mph, the center said in a morning update. Harvey was expected to linger for days over Texas and bring as much as 40 inches of rain to some parts of the state. The latest forecast storm track has Harvey looping back toward the Gulf of Mexico coast before meandering north again on Tuesday. Nearly 10 inches of rain had already fallen in a few areas in southeastern Texas, the center said. Flash floods have already hit some areas, the National Weather Service said. As many as 6 million people were believed to be in Harvey’s path, as is the heart of America’s oil-refining operations. The storm’s impact on refineries has already pushed up gasoline prices. The U.S. Environmental Protection Agency eased rules on gasoline specifications late on Friday to reduce shortages. President Donald Trump, facing the first big natural disaster of his term, said on Twitter he had signed a disaster proclamation that “unleashes the full force of government help” shortly before Harvey made landfall. “You are doing a great —the world is watching,” Trump said on Saturday in a tweet referring to the Federal Emergency Management Agency (FEMA), which coordinates the response to major disasters. Utilities American Electric Power Company Inc and CenterPoint Energy Inc reported a combined total of around 237,000 customers without power. While thousands fled the expected devastating flooding and destruction, many residents stayed put in imperiled towns and stocked up on food, fuel and sandbags. The size and strength dredged up memories of Katrina, the 2005 hurricane that made a direct hit on New Orleans as a Category 3 storm, causing levees and flood walls to fail in dozens of places. About 1,800 died in the disaster made worse by a slow government emergency response. Texas and Louisiana declared states of disaster before Harvey hit, authorizing the use of state resources to prepare. Residents of Houston, the nation’s fourth most populous city, were awakened early on Saturday by automatic cellphone warnings of flash floods. The city warned of flooding from close to 20 inches of rain over several days. U.S. gasoline prices spiked as the storm shut down several refineries and 22 percent of Gulf of Mexico oil production, according to the government. Many fuel stations ran out of gasoline before the storm hit. More than 45 percent of the country’s refining capacity is along the U.S. Gulf Coast, and nearly a fifth of the nation’s crude is produced offshore. Ports from Corpus Christi to Texas City, Texas, were closed to incoming vessels and Royal Dutch Shell Plc, Anadarko Petroleum Corp., Exxon Mobil Corp., and others have evacuated staff from offshore oil and gas platforms. Disruptions to fuel supply drove benchmark gasoline prices to their highest level in four months. The U.S. government said it would make emergency stockpiles of crude available if needed to plug disruptions. It has regularly used them to dampen the impact of previous storms on energy supplies.